Successfully Added Kids Watch Phone With GPS Tracker - Traditional Quartz Design, Digital Fence, Familiar Number, SOS, Wireless Charging (Green) to your Shopping Cart. Never lose track of your children’s whereabouts again with this colorful children GPS wrist watch. Coming in a beautiful colorful yet traditional design this electronic gadget looks like a regular child wrist watch from the outside yet hides some extremely accurate tracking software and powerful hardware inside. Using both GPS and LBS tracking technology you will now be able to keep track of your children via your smartphone no matter where they are headed. Although it might not look like it from the outside this traditional looking wrist watch features both a built-in mic and speaker, allowing dual-way communication at any time and turning it into a state-of-the-art phone watch. Simply slip in a SIM card and from now on your child will always be within reach. Thanks to its safety setting you can program the watch’s software in such a way that it can only receive calls from familiar phone numbers, ensuring that your child never receives a call from a stranger. With its Digital Fence setting, you will be able to set up an area in the neighborhood that is considered to be within safety range for your children. Once your children pass the digital fence a notification will be sent to your smartphone, informing you where your child is currently located and giving you the option to check on him instantly. 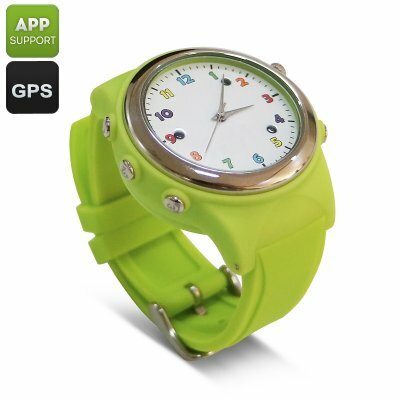 Additionally, this GPS wrist watch has been equipped with an SOS button and ‘’familiar phone number’’ button, allowing your child to contact you instantly when in need. Its built-in microphone furthermore allows you to listen to your child at any given moment without disturbing them. As this traditional looking child phone watch with GPS features no digital screen it will not cause any distraction to your children as mobile entertainment such as games and video’s can not be played on this device. Being compatible with Android and iOS you can be assured that this child safety watch along with its mobile application can be efficiently synced and used on the majority of smartphones out there. This kids wrist watch phone comes with a 12 months warranty, brought to you by the leader in GSM smart watches as well as wholesale electronic gadgets..